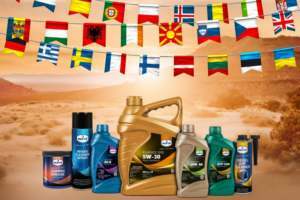 Eurol Nautic Gear Outboard | Eurol B.V.
Eurol Nautic Line Outboard Gear Oil is a mineral gear oil, formulated according to the latest phosphor - sulphur technology. This special additive technology assures an excellent protection against metal-to-metal contact of the gears under the most severe operating conditions, even under shock loads. Eurol Nautic Line Outboard Gear Oil contains special additives, leaving a protecting oil film for optimum corrosion protection. Eurol Nautic Line Outboard Gear Oil shows an excellent oxidation and thermal stability. Seals are not affected by this product. Eurol Nautic Line Outboard Gear Oil contains additives that protect materials against water seepage Eurol Nautic Line Outboard Gear Oil is recommended for use in gear cases of outboard engines as well as in lower gear units.